JLL are a well-known and trusted brand in the fitness world. There exercise bikes provide great value for money and reviews are positive overall. 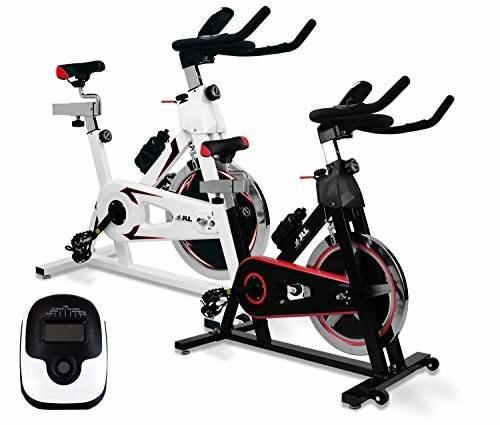 The JLL IC300 Indoor Cycling Exercise Bike is one of their bestselling models. In this review we put it through it’s paces to see if it is worth your hard earned money. Take your fitness up a gear with the JLL IC300. 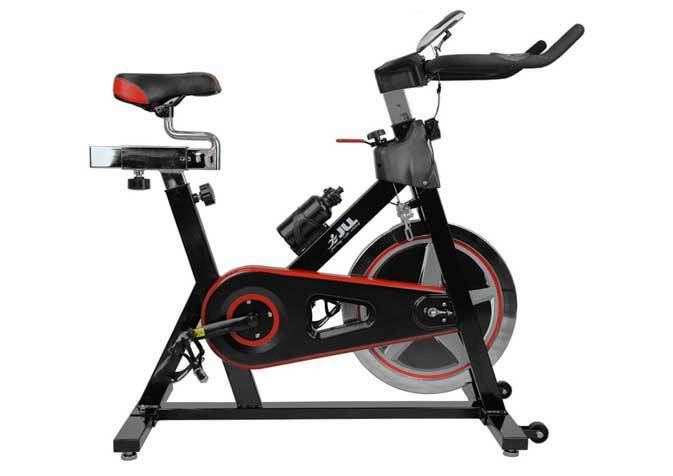 Perfect for every fitness enthusiast, this bike provides the latest indoor cycling technology at a competitive price. Ensures studio standard cycling that’s ideal for any home. Dimensions: 110cm (H) x 127cm (L) x 51cm (W). 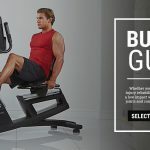 The JLL Brand have built a reputation on making affordable high quality home exercise equipment and with many of their models been the bestsellers on Amazon the quality is said to be a sure thing. First of all this is a fairly cheap exercise bike, however that doesn’t mean that it isn’t well made. Weighing in at a hefty 46Kg is a good indicator that this isn’t a flimsy bike made from poor quality materials. 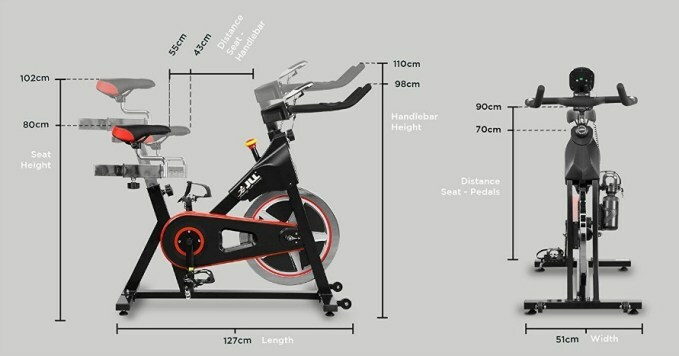 This is a spin bike and with a flywheel weighing 18 Kg a good workout is offered for both beginners and the experienced. With this been a direct chain driven spin bike you do get the sensation of being on a real bike. That been said in addition to pedaling forward the user can also pedal backwards. 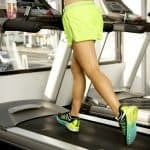 This is good for working the back leg muscles that ordinary forward pedaling doesn’t engage. Not all exercise bikes have this feature so some plus points there. The seat and handlebars are both fully adjustable. The seat is adjustable to 10 vertical levels and 6 horizontal levels giving a wide range of movement for people of varied height. The handlebars are capable of being adjusted by 6 horizontal levels. Using both of these adjustable features together the user should be able to get a comfortable seating position for their exercise workout. However a few reviews do say how uncomfortable the seat is. If you do find this seat uncomfortable there is always the option of buying a padded cover. These can be bought for under £10 and make any exercise bike a lot more comfortable. The monitor has a total of six functions. these are time, speed, distance, calories, odometer and finally pulse. The monitor is simple to use and even the biggest of technophobes should be able to get to grips with its uses. A feature worth mentioning is the pulse rate. 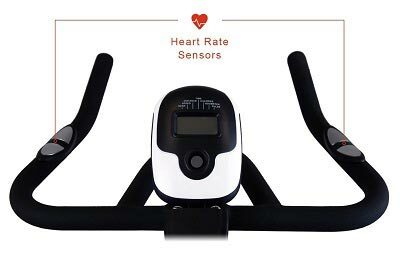 Built into the handles of this exercise bike are heart rate sensors which take an accurate measurement of a user’s pulse. 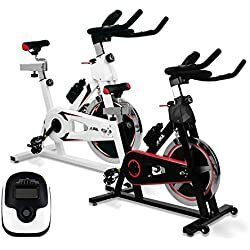 This is always good to know when exercising and with many people buying devices that measure pulse, there is no need to pay that added expense with this exercise bike. This bike uses a friction based system. For those that don’t know this is where a brake pad applies friction to the flywheel to create resistance. 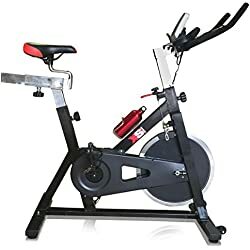 Generally speaking the heavier the flywheel the more resistance can be created and with an 18Kg flywheel this spinning bike can create enough to test the experienced exercise bike user. The JLL IC300 has a maximum user weight of 130 Kg which is equivalent to 20.5 stone. In addition to been a heavy bike reviews state how sturdy it is when in use. Very impressed with the overall quality of the bike. It is excellent value for money. Really super. BUT must have been designed by a man – that saddle is painful. This exercise bike comes with a free water bottle that fits snugly into the bottle holder on board the JLL IC300. 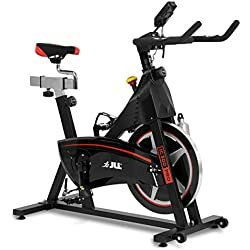 If it’s a cheap spin bike that is built to a good standard that you’re after then the JLL IC300 exercise bike meets that criteria. Well built and with a stylish look this in our opinion and hundreds of Amazon buyers is a good buy.